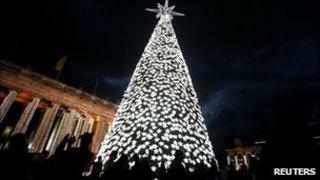 The Colombian army says it has installed a giant Christmas tree in Farc rebel territory, to encourage guerrilla fighters to demobilise. Special forces infiltrated the remote Macarena mountain range to dress a 25m (82ft) high tree with 2,000 lights. Movement sensors will make the tree light up when guerrillas approach. The army says it will put up trees in nine other rebel-held zones to spread the message that Christmas is a good time to abandon armed struggle. The Colombian government says more than 2,000 guerrillas demobilised this year under a scheme that gives them amnesty and help to return to civilian life. "Operation Christmas," as it was code named, was carried out by elite troops using Blackhawk helicopters. The Christmas tree was installed near a rebel supply route in the region where the Farc military leader, Mono Jojoy, was killed in a large-scale military assault in September. As well as lights, it was decorated with slogans saying "Demobilise, at Christmas everything is possible" and "If Christmas can come to the jungle, you can come home". The leftist Farc rebel group has suffered severe setbacks in recent years, with several of its top commanders killed. Thousands of guerrillas have been captured or killed or have deserted rebel ranks. But it still has thousands of fighters and remains a powerful force in some rural areas.